These terms and conditions apply to all playing members of Croham Hurst Golf Club Limited (“the Club”). The Club is a company limited by guarantee and while a member, or within one year afterwards, your liability on any winding up the Club is limited to £1. The Club is open to the whole community without discrimination of any kind and is registered with the Community Amateur Sports Club (CASC) Scheme. In addition to these terms and conditions, members are subject to the matters and procedures set out in Club’s Articles of Association. These cover such matters as how and when to call general meetings, voting rights, the election and powers of the directors as well as disciplinary procedures. If there is any inconsistency between these terms and conditions and the articles of association then the latter takes precedence. Members must also abide by the Regulations, Rules and Bye-Laws of the Club. These cover such matters as how the Club is run, the responsibilities of members regarding dress code, use of car park; and handicaps, competition rules and etiquette on the course. These Regulations, Rules and Bye-Laws are also on the web-site. The Club has differing categories of membership that take account of the restricted availability of tee times on the course and the age of members. Members must abide by the day and time restrictions imposed by their type of membership. The various categories are designed to provide suitable playing options for your lifestyle and current situation as well as making best use of the course. 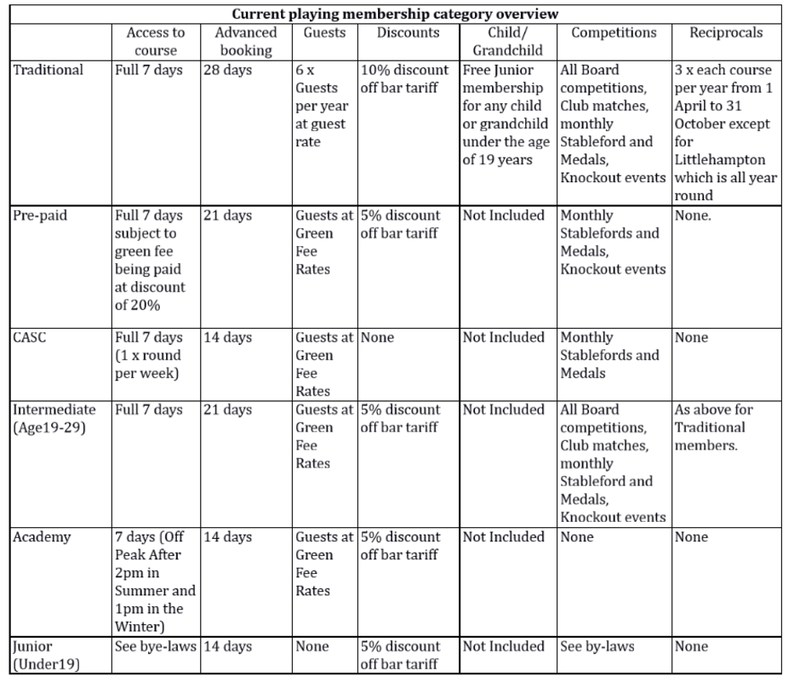 Not all membership categories may be available at all times and the Club may decide to stop providing certain categories. The Club will inform members of any such restrictions when they join or when a category changes or ceases to be available. All new members are required to complete an application form that contains some personal and bank information. Whoever signs the membership application form will be jointly and individually responsible under this agreement. This means that each of those persons will be responsible for paying all the appropriate membership subscriptions and any other charges that they may incur for any other person for whom they have signed the membership form, for example, a spouse or child. All categories of membership cover a calendar year. Membership will begin on the first day of the month following the day upon which the membership application form was completed. Should there be some linked or associated members who use the facilities, for example, children or grandchildren of members, these persons need to be identified on the application form. In such a case, we will need a letter of permission from the person that has parental responsibility for the child to play the course or to have golf lessons. your membership is either suspended or terminated. Your subscription includes membership of the Surrey Golf Union and England Golf, as well as cover under the Club’s personal liability insurance. You will be notified of the annual membership subscription, having regard to your category of membership, when either you join or 30 days before your renewal date. The Club reserves the right to alter the annual subscription rate from time to time. This will normally occur at the renewal date. When you receive notification of either a renewal or a change in the subscription rate you will have the option of renewing or declining your membership. You will not become a member or have the right to play the course until the appropriate annual subscription has been paid. If the annual subscription is to be paid by 10 monthly installments a Direct Debit or standing order must have been processed. There is currently no extra charge for this method of payment. If payment is to made in cash a schedule of payments must be agreed in writing. Payments by Direct Debit will continue to operate beyond the first subscription year. If you decide not to renew your membership you must notify the Club in writing (or by email) at least 14 days before the renewal date of your membership. Failure to do so will result in the automatic renewal of your annual membership. All categories of membership cover a 12-month period. Should you decide to cease membership partway through the year there is no right to any refund. However, appeals (on the basis of injury or relocation for example) may be considered on an individual case basis at the discretion of the Club. The normal renewal date for membership is the 1st May each year. However, you may to choose to renew on the anniversary of the date when you joined the Club. Should you either have failed to pay or arranged to pay your subscription by your renewal date you forfeit your rights as a member of the Club until full payment has been received or a payment schedule has been agreed. The Club may provide other services for the convenience of members. These include the provision of lockers and the use of trolley sheds. You will need to apply for the use of these facilities, as there are a restricted number available. There will be an annual charge for the use of these facilities that will be billed at the same time as your annual subscription. There will also be a charge to replace lost keys. Shortly after you become a member you will be issued with a membership card that can be used for purchases of food and drink and in the case of Pre-Paid Access members to pay for their rounds of golf. You will be able to place money on the card either online using the Club’s website or by cash, debit or credit card at one of the Club’s tills or in the Office. You are responsible for the safekeeping of your card. If it is damaged, lost or stolen please inform the office as soon as possible and they will issue a replacement. The Club encourages members to review the transactions on their cards. Details of your account can be accessed via the Club’s website. Depending on your category of membership you will be entitled to a discount on bar purchases when using your membership card. The Club reserves the right to vary the amount of these discounts from time to time. There are two broad categories of membership – playing members and social members. These terms and conditions solely apply to playing members. The rights and responsibilities of Social members are covered by the terms and conditions of Croham Hurst Golf Trading Company Limited. Some membership categories are closed to new entrants but may be renewed. This restriction also applies to existing members who may not change from their current membership category into one that has deemed to be closed to new entrants. The Club reserves the right to limit the number of members in each category and to introduce or dispense with different categories of membership. Any membership category that allows Full 7 day access means that you have full access to the course 7 days a week except for those times that are reserved for club competitions, booked society events, booked visitor green fees or when it has been decided by the Club’s staff or Golf Professional to close the course for maintenance or adverse weather conditions. Our most popular option for those who intend to play on average once a week or more. On this basis it provides the greatest value for money. Tee reservations can be made any day of the week or weekends up to 28 days in advance. All forms of competitions and club matches are available under this option. Reciprocal arrangements with other clubs are also included. You may also sign in up to 6 guests a year and use the special members guest rate. Bar purchases attract a 10% discount. This option also permits members who have young children or grandchildren under the age of 19yrs to become junior members of the club free of charge. This membership is designed to meet the needs of those people who are unable to play as often as other members but would still like to keep or maintain a golf handicap and enjoy competitions. Your membership card is credited with your annual membership fee when paid less a £25 charge to cover your Surrey Golf Union and England Golf subscription fee together with cover under the Club’s personal liability insurance. The balance may be used to purchase tee times, drinks at the bar, food or tickets for functions. There are no conditions on how the balance may be spent, just that the balance must be used within 12 months as it cannot be carried forward or transferred. Card top ups can be made at any time and any balance can be carried forward but not transferred to another member. You have full 7 day access to the course. Tee times must be booked in advance of playing, either by using the Club’s on line system or by notifying the Golf Professional. You are able to book up to 21 days in advance. Prior to playing you must check in at the Pro shop when your membership card will be debited with the cost of your round. If for any reason the Pro shop and the Office are closed when you wish to play you must have informed them of your intention to play beforehand. The cost of a round of golf is dependent on the green fee rate charged to non-members less a 20% discount. You are able to bring guests but they shall pay the standard green fee rate applicable. Pre-paid Access membership allows you to play in monthly stableford or medal competitions and knockout events dependent on handicap. You are not permitted to play in Board competitions intended for traditional full 7-day members or any inter club events. The aim of the Club is to bring the game of golf to the whole community. If you are on a limited budget and cannot afford to pay the standard membership fees of the Club you may apply for a discounted CASC membership. You will need to show that you are on a low to modest income that is insufficient to allow you to pay the standard subscription rates. The Club reserves the right to see appropriate documents in support of the financial position of the applicant. Should your financial circumstances change that would enable you to pay the standard fees you should inform the Club within 30 days. The Club reserves the right to ask you to re-affirm your financial position at any time. The number of members in any category, including CASC members, may be limited by the Club having regard to the usage capacity of the course and the viability of the Club. As a CASC member you are entitled to play one round of golf per week up to a maximum of 52 rounds in the year. You are not limited to any specific times or days of the week. You can book a tee time up to14 days in advance. You must follow the standard tee checking in procedure and cancellation protocols. This category of membership is aimed at aspiring golfers aged between 19 to 29 at the time of joining the Club or renewing their membership. The Club recognises that members in this age group face increasing financial pressure and as a result offer a discounted fee whilst still offering the main benefits of full membership. As an academy member you join a 12 month teaching programme that includes all your lessons. You have unlimited access to the practice grounds and access to the golf course at non-peak times. The Club tries to encourage young people to take up golf by providing golf lessons and reduced membership rates to those juniors aged under 19. The playing times of juniors are set out in the Club’s bye-laws as these are dependent to a certain extent on handicaps. All Junior members are expected to acquaint themselves with the etiquette and Rules of Golf as is also expected of other members. As a member you may invite a guest to play a round of golf at the Club. For certain membership categories your guest will enjoy a discounted members guest green fee. All guests must sign in at the Pro shop and provide their name and the golf club at which they are a member. You must accompany the guest at all times on the golf course and ensure that the guest is aware of and complies with the Club’s Rules and Regulations. You are restricted to inviting a guest at a reduced rate on only 6 occasions in the Club year. This doesn’t include invitations to Open competition days. You may only invite up to 3 guests on any one day. 5-day members are subject to the following terms and conditions in addition to those that apply to full members. Access to the course is restricted to weekdays Monday to Friday inclusive at any time subject to the Club’s rules on starting times and the tees being reserved for club competitions. The exception being on Bank Holidays when play is only allowed after 2p.m. If you wish to play at the weekend then as a 5-day member you need to pay a green fee equivalent to a Members Guest green fee. Members have access to the course from Monday to Saturday inclusive. You may enter Saturday competitions. If you wish to play on a Sunday then you need to pay a green fee equivalent to a Members Guest green fee. Members have access to the course from Monday to Friday inclusive and after 11.15a.m on Saturdays and Sundays. You may enter Monthly Medal competitions but may not enter certain Club “board” competitions that take place on a Saturday. If you wish to play before 11.15a.m on a Saturday or Sunday you need to pay a green fee equivalent to a Members Guest green fee. The Club operates an on-line tee booking system that members are encouraged to use. Tee bookings may be made up to 28, 21 and 14 days in advance dependent on the category of playing membership. The Club reserves the right to change the rules applicable to advanced bookings of tee times. All members must book their tee time, either by using the Club’s on line booking system or by requesting the Golf Professional or one of the Club’s staff to do so on their behalf. The purpose of booking tee times is for your convenience and to better manage the use of the course. When booking a tee time the names of all those playing with you must be entered on the system. All playing members together with any guests are required to register with the Golf Professional before the start of their round irrespective of whether or not they have booked a tee time. Any guest or green fees must be paid before the round is started. If you have booked a tee time and find that you are either unable to play or the number of players has changed, then the booking should be amended on the online system accordingly. Alternatively, the Golf Professional should be informed as soon as possible. The Club recognizes that members may decide not to play at very short notice because of adverse weather conditions or emergencies. The club will monitor frequent failures to cancel a booking as this may prevent other members from playing or lead to a loss of potential revenue in green fees to the Club. Any continued abuse of the booking system may lead to disciplinary action. Certain club competitions are restricted to certain handicap categories and timings, for example, summer / winter knockouts and mixed competitions. Details of such competitions are available to you on the Club’s website. Traditional full 7 day access playing members are able to enter most of these competitions, however, if your playing partner has a restricted membership they may not be entitled to play certain competitions that take place at the weekend. An option for them would be to pay a green fee. You need to check any such restrictions before entering a competition and booking a tee time. The Club reserves the right to impose restrictions on starting times and the format of play in order to make best use of the course. Most of the restrictions apply to playing at the weekends when the course is at its busiest. The starting times are set out on the Club’s website. Membership of the Club is for 12 months. If you decide to cancel your membership you must give 30 days notice to the Club in writing before your renewal date, otherwise you become liable to pay the following years subscription. In order to avoid any dispute as to whether or not this notice was properly delivered we recommend that you request confirmation from the Club that it has been received or ensure that you have some evidence to show that it was properly delivered. Should you decide to stop playing golf during the course of the year no refund becomes payable whether you paid your subscription by a single annual payment or by installments. Your liability remains to pay the full annual subscription. There may be exceptional circumstances when the Club may decide to suspend your membership. Such circumstances may include for example, long term illness or moving home far away from the Club. The onus is on the member to inform the Club in writing of your particular circumstances as to why you wish your membership to be suspended. In the case of long-term illness your condition must result in you not being able to play golf for a period exceeding 2 months. Whatever the period of time that you are unable to play will be deducted proportionately from your following year’s subscription. For example, if your annual subscription is £1,595 and you were unable to play golf for a full 3 months then your following years subscription will be reduced by £398.75. The maximum discount to be applied is 50% of your following years subscription. In the case of moving away from the area your new home must be more than 50 miles from the Club and your annual membership must have at least another 6 months to run at the time that the move takes place. In these circumstances the Club may use its discretion to change the category of your membership to Pre-paid Access on a pro-rata basis. The Club may expel any member who shall willfully refuse or neglect to comply with the provisions of its Articles of Association and the Rules and Regulations and Bye-laws. The disciplinary procedures that need to be followed to ensure an unbiased hearing and outcome are set out in the Articles of Association. In no circumstances shall a member expelled, suspended or disciplined under these procedures have a remedy against the Club and shall in the case of expulsion forfeit all rights and claims upon the Club and its property. The Club does not accept liability for damage or loss to either your property or to a guest’s property that may happen on the premises, which includes the car park, the trolley shed and lockers, as well as on the golf course. The exception being, where a liability arises through the Club’s gross negligence or failure to take reasonable care to avoid any such losses being incurred. The Club does not accept liability for the injury or death of any member, child or guest that may happen on the premises or grounds of the Club other than a liability that arises due to the Club’s gross negligence or failure to take reasonable care. Whilst the Club does have an insurance policy to cover personal injury to members and guests that may be incurred on its golf course this does not extend to damage and loss to property or equipment. The Club encourages all members to arrange their own insurance cover.